I’ve been a repeat offender with this outfit over the last few weeks… I wore it first when I was in Tokyo (shot in front of the Ralph Lauren store in Omotesando) a few weeks ago and again yesterday in Chicago grabbing some drinks with girlfriends at City Winery on the riverwalk. These striped wide-leg pants were a random buy at Zara when I was in Croatia last summer, but luckily this style is still very on-trend so there are lots of similar buys out there! I bought these oversized round sunglasses online before Coachella, fully expecting to not like the way they looked on me. Round sunglasses can be super tough! But much to my surprise, I actually love them. They’re shockingly easy to wear, I’ve had multiple friends put them on and like the way they fit, too. I got this textured crop top back in the fall, but it’s been great for spring days, too! (See how I wore it in London in this post!) I don’t know what it is, but I always love a short-sleeved sweater. Maybe because they signify the end of winter and warmer days ahead? This crop top is particularly great with all of my high-waisted skirts and pants. Unfortunately this top is now sold out, but I found a few similar styles here, here, here, and here. I wore this outfit for a day of exploring in Omotesando, one of my favorite neighborhoods in Tokyo. It’s the perfect weekend ensemble… It feels put-together, but couldn’t be more comfortable or practical to wear! As for Omotesando, Merritt and I had grabbed lunch at Maisen (such great tonkatsu) on our last trip to Tokyo and fell in love with the surrounding neighborhood of Omotesando. The cutest winding streets and alleyways lined with great shops and little restaurants. Be sure to check out this post with every outfit I wore in Japan! Simply fantastic! Those pants are perfect! 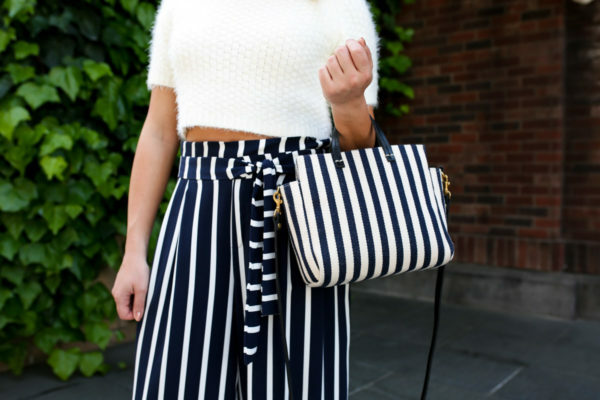 The stripe wide-leg is seriously the perfect pants! I would totally wear it on repeat too! So in love with your cute look with the striped pants! I love this outfit so much!! I love how you paired the stripes in the shorts and bag. I really need to step up my outfit game, especially for the summer!